This is just a quick-and-dirty (but not actually dirty!) 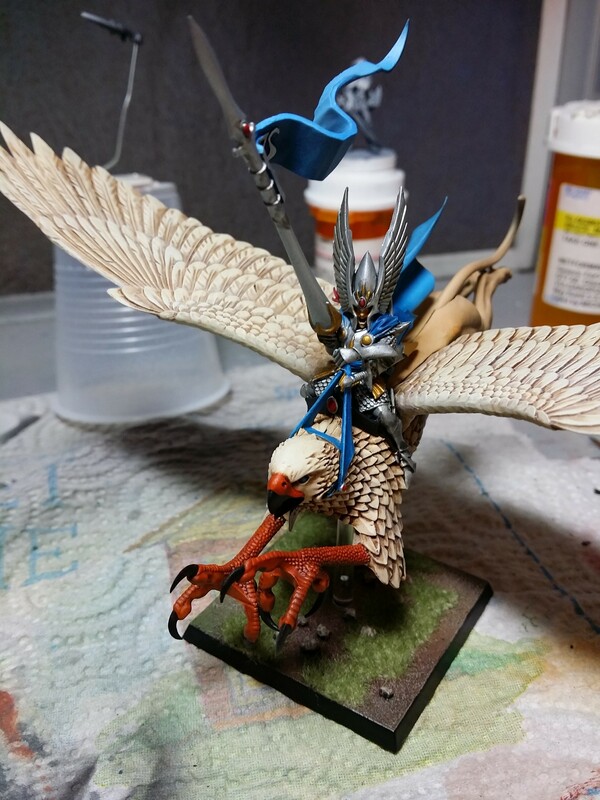 how-to for a tabletop level High Elf Prince on Griffon from the Island of Blood boxed set. 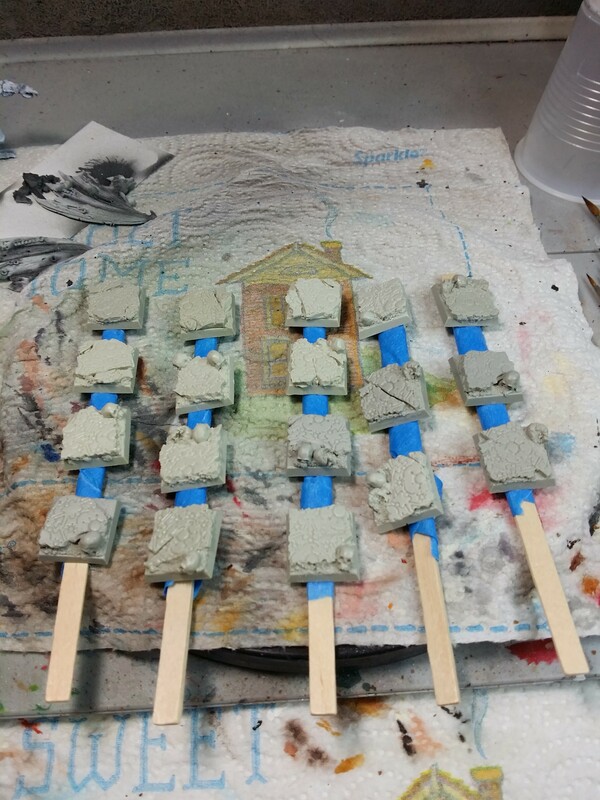 First, clean the mould lines, assemble, fill gaps, etc. as desired. Next, prime with zenithal lighting. This will give you basic, strong lights and darks to start with. 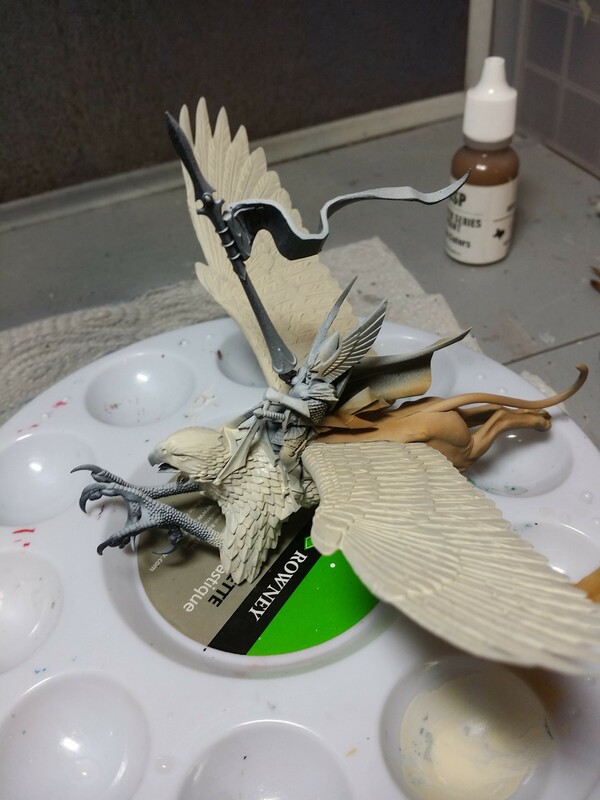 Next it’s a good idea to get the base started so it can dry while you paint the griffon. I used Vallejo Red Oxide Paste and added a little large-ish ballast while the paste was still wet (it’s an excellent glue). 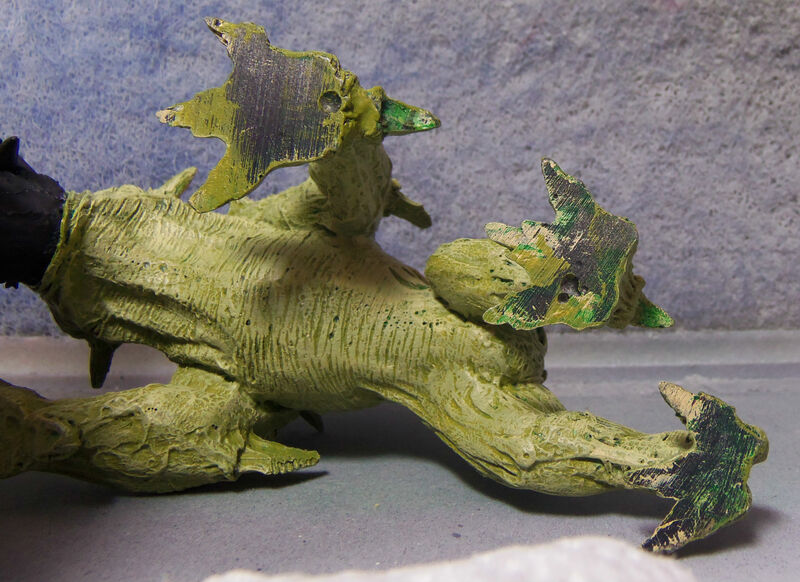 You could just as easily coat the base with PVA glue and apply sand. Now you need to select a light, medium, and dark shade for the flank of the griffon. I used RMS Golden Highlight, RMS Golden Shadow, and RMS Olive Skin Shadow. 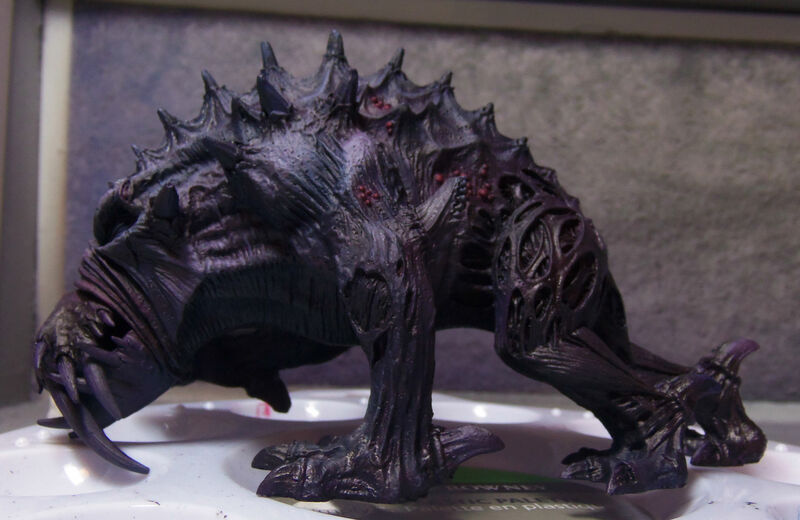 For the quickest work, use an airbrush to apply the paints. If you don’t have one, then a large brush will go a long ways to speeding things along. As long as you maintain your brush tips, even very large brushes can paint very tiny details. 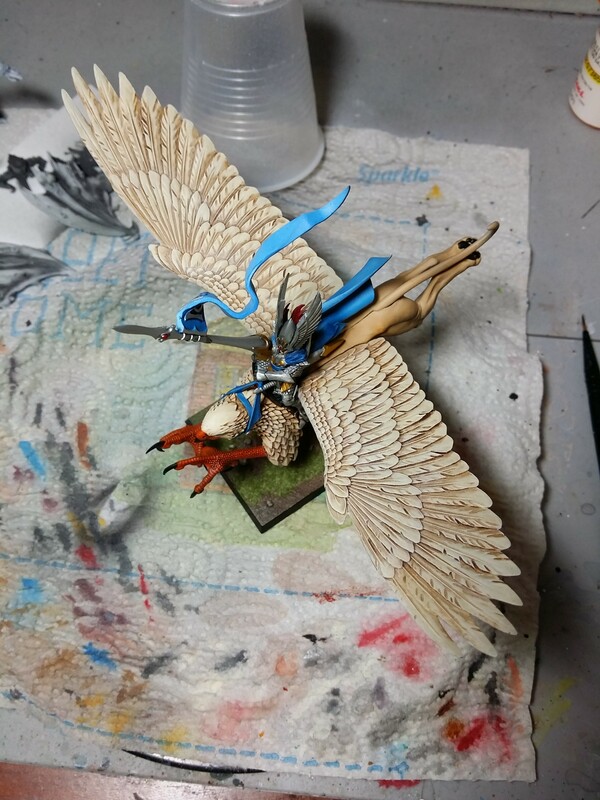 Details as small as eyes can be painted with the tip of a size 3 W&N Series 7, so the flank of a High Elf griffon should be no problem. 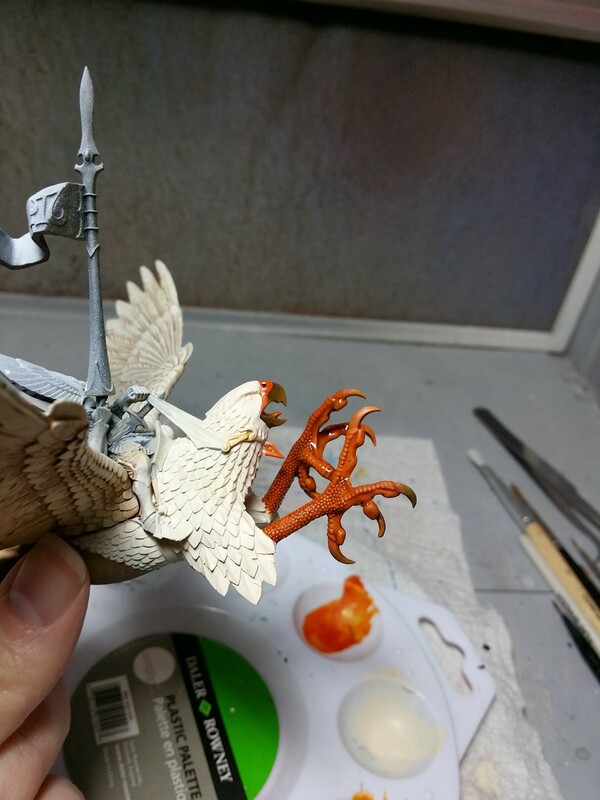 Also, paint the base coat on the feathers. I used RMS Creamy Ivory. The next step is to wash the feathers on the wings. 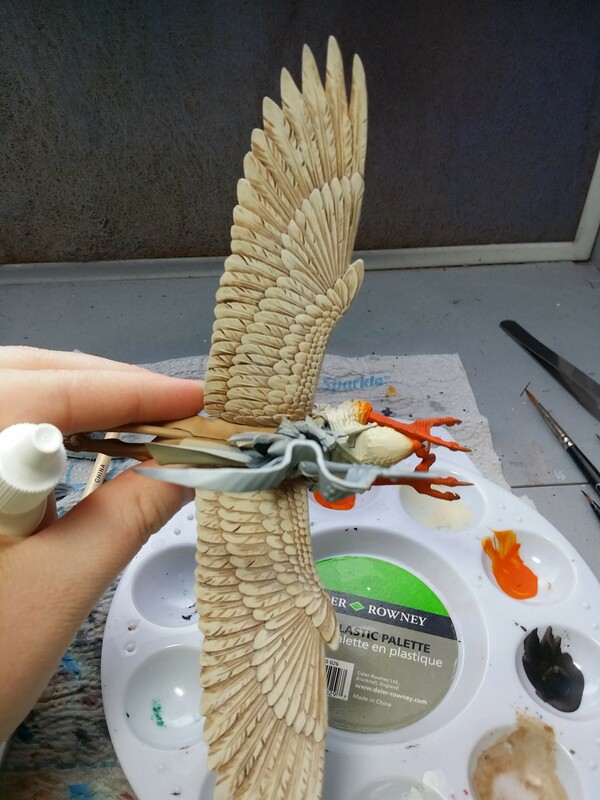 You could also wash the feathers on the body at this point, although I didn’t do that until later in the process when I painted this model. I used a watercolor wash, but you could use a premade wash, watered down acrylic paint, or an oil wash. All will have results that are a little different, but all should still turn out fine. If you plan to use an oil wash, make sure to remember to satin varnish before you apply it so you can effectively clean it up after. 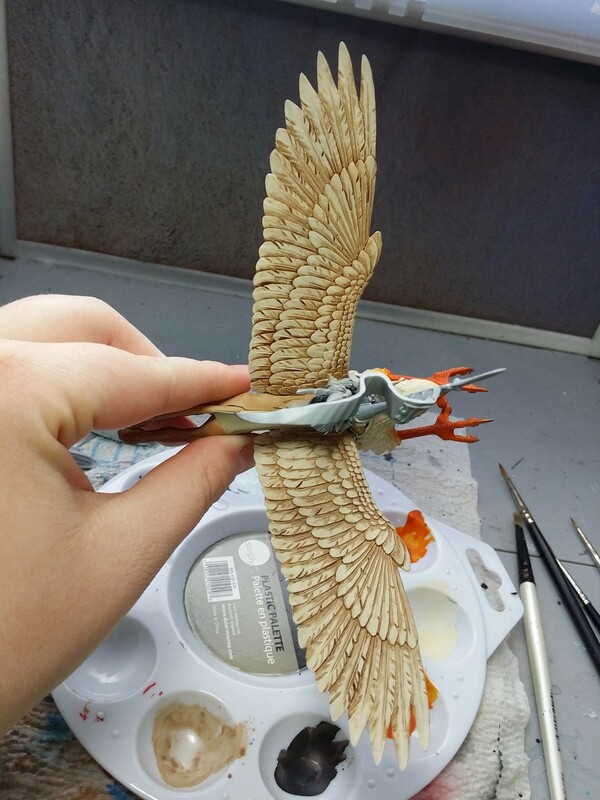 After I cleaned up the watercolor wash, it was time to drybrush the wings. I used RMS Linen White, which is a little lighter than the original base of Creamy Ivory, but not a stark white. At this point, check your base. If it’s dry, then it’s time to start applying paint to it. I airbrushed it, but if you don’t have that option then make sure to use a large brush. Make sure to switch away from your really nice brushes so the rough texture of the base doesn’t tear up the bristles! I covered my base in VMA Black, then RMS Olive Skin Shadow. I also applied a little VGC Goblin Green and RMS Sandy Brown to make it more interesting. 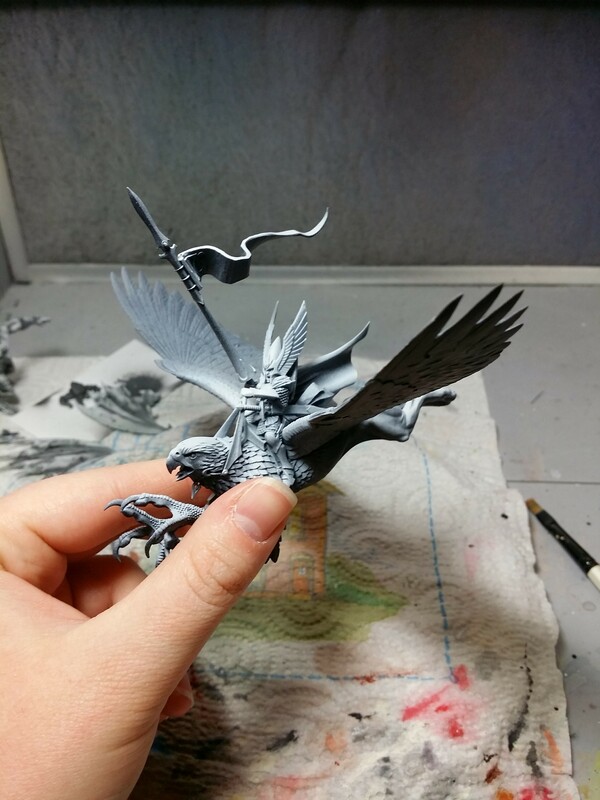 Now it’s time to work on the details of the griffon. 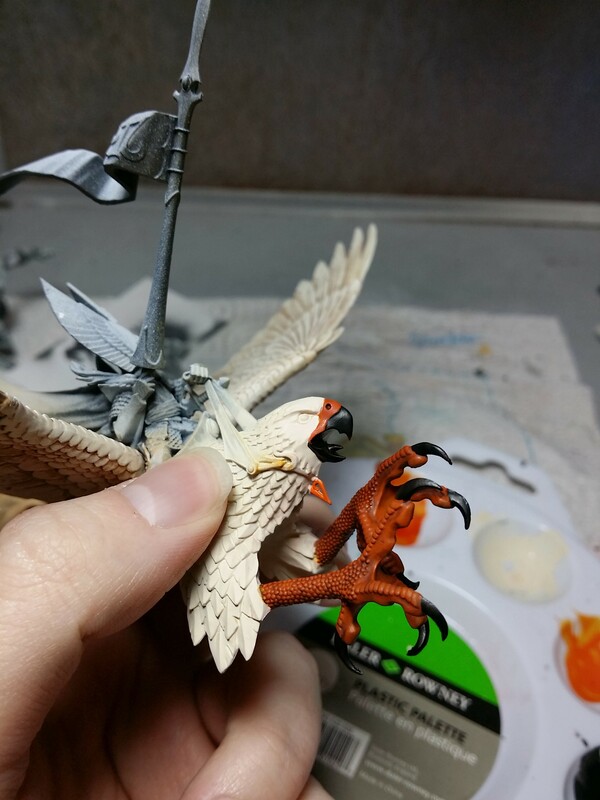 First, paint the legs and beak a color of your choice. I used RMS Explosion Orange. After, wash the legs and beak. I used Army Painter Strong Tone Ink. 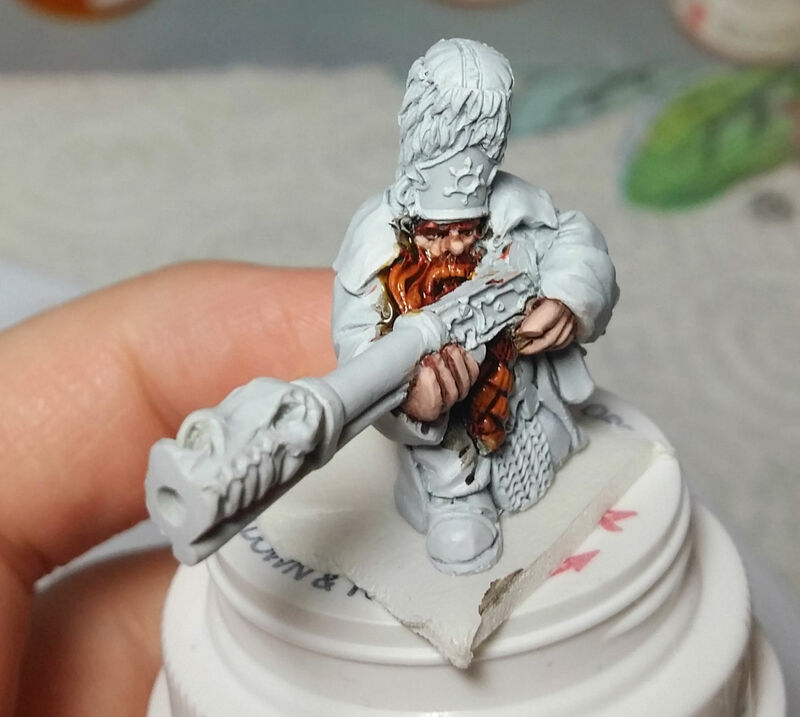 I really like the Army Painter inks for making quick, neat work of things like this. 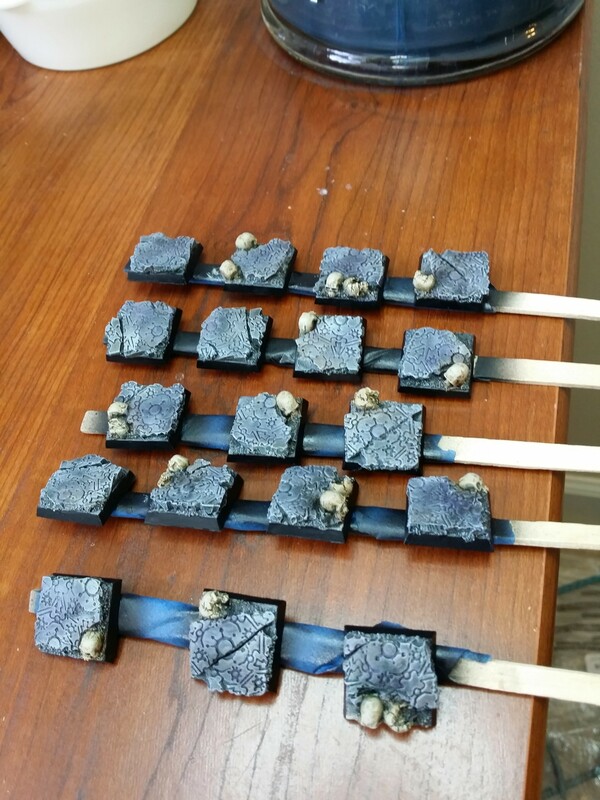 I feel like they apply a lot easier than GW washes, and they stay where you put them. After, I applied VMA Black to the tip of the beak and the talons. At this point I washed the rest of the feathers, but it would have been fine to do that earlier as well. 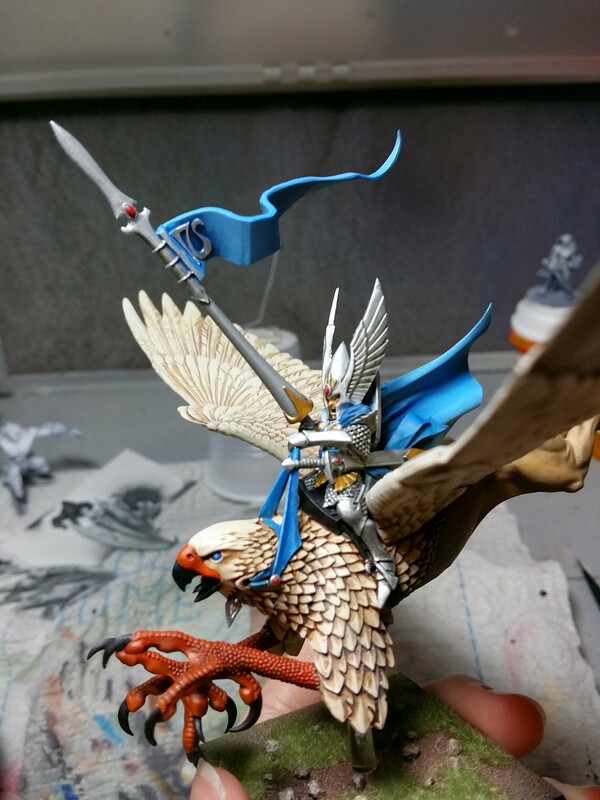 Drybrush the body feathers the same as the wing feathers, and now it’s time to get to the tiny High Elf Prince. 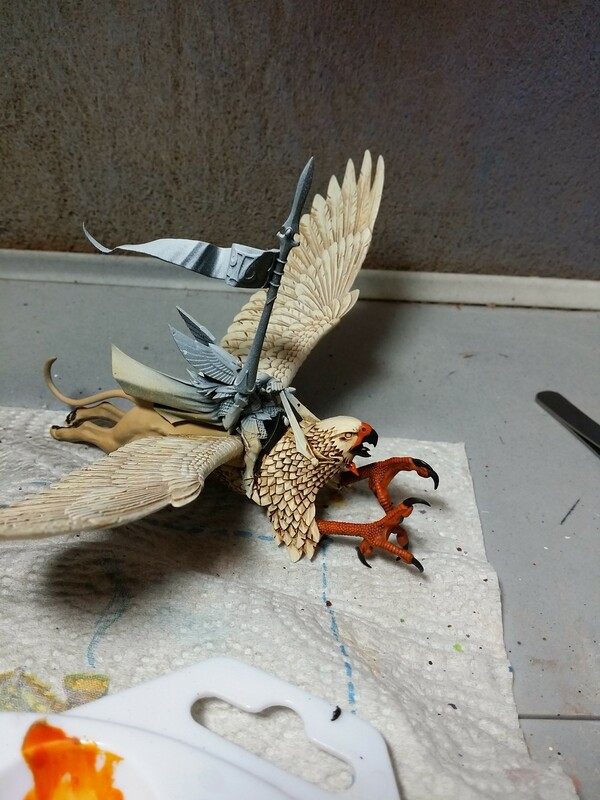 If you’re airbrushing, mask off the top of the griffon under the cloak. 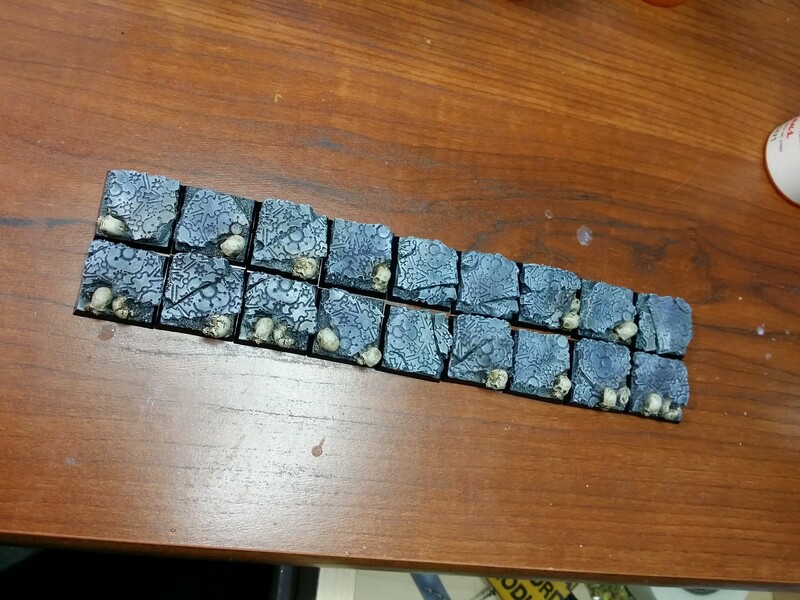 I used a couple small strips of blue painter’s tape. 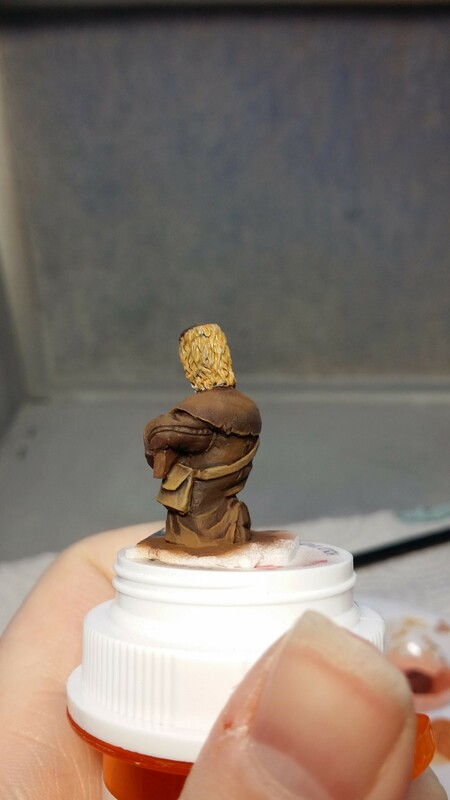 Because of the zenithal priming, a shadow color really isn’t necessary on the cloak and banner, so pick a mid-tone and a highlight. I used RMS Sapphire Blue and RMS Sky Blue. Apply these colors to the cloak, banner, reigns, griffon’s eyes, and the rest of the cloth on the prince. 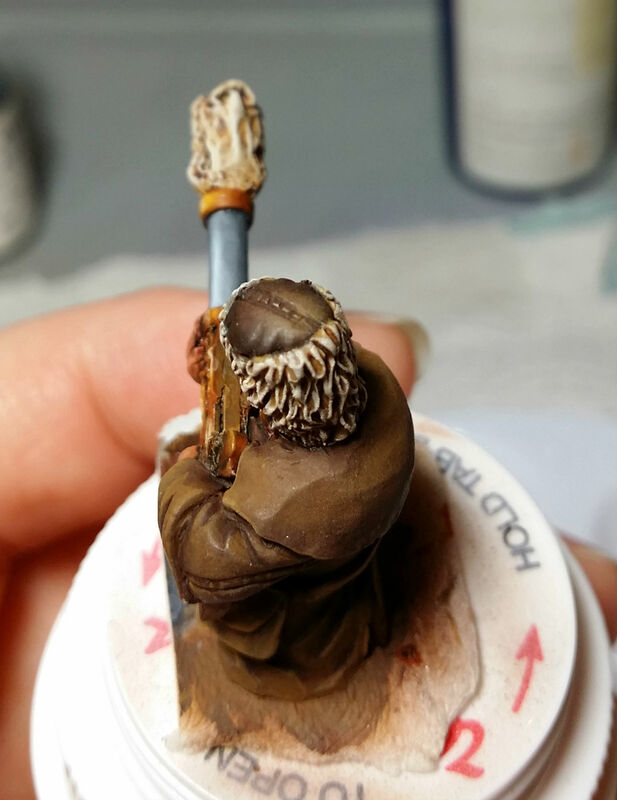 I washed the tiny bits of cloth on his body with Army Painter Blue Tone Ink before highlighting for a little extra contrast. Next, apply a skin color to the prince’s face and wash. 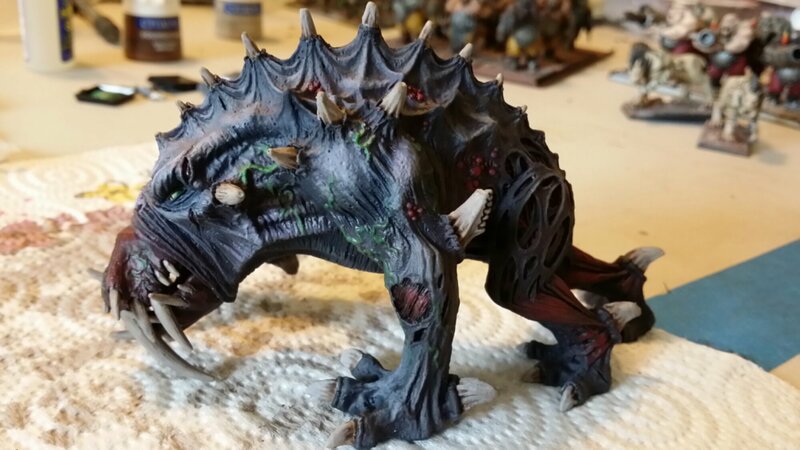 I used VGC Elf Skin and Army Painter Strong Tone Ink. After that, apply a silver to the armor and lance. I used VMA Aluminum. When that paint has dried, wash the armor. I used a thinned VMA Black as a wash. 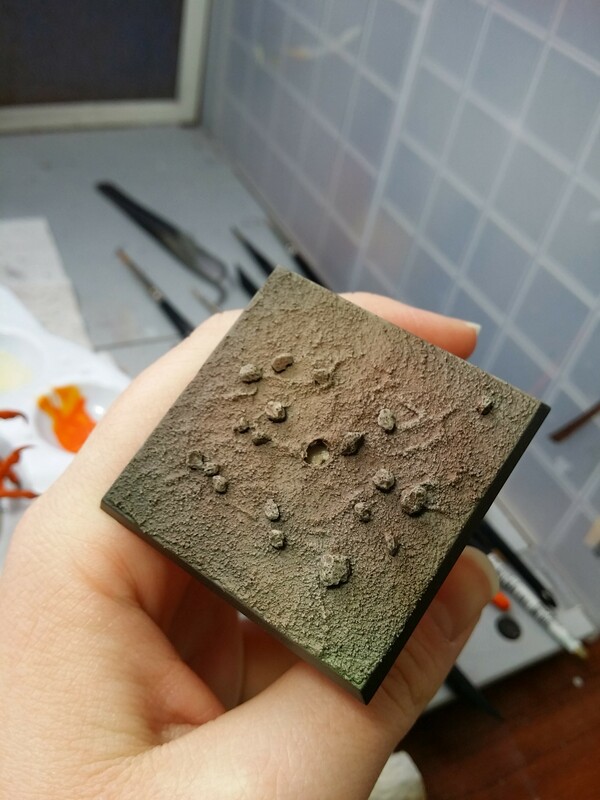 While that dries, drybrush your base. I used RMS Terran Khaki. When your wash has dried, clean up the silver metal where necessary. Then apply gold where you choose. Also, paint in the gems on the elf and any other tiny details that are left. Apply flock to the base, attach the model, and you are done! Picture of him will go up in the gallery soon! 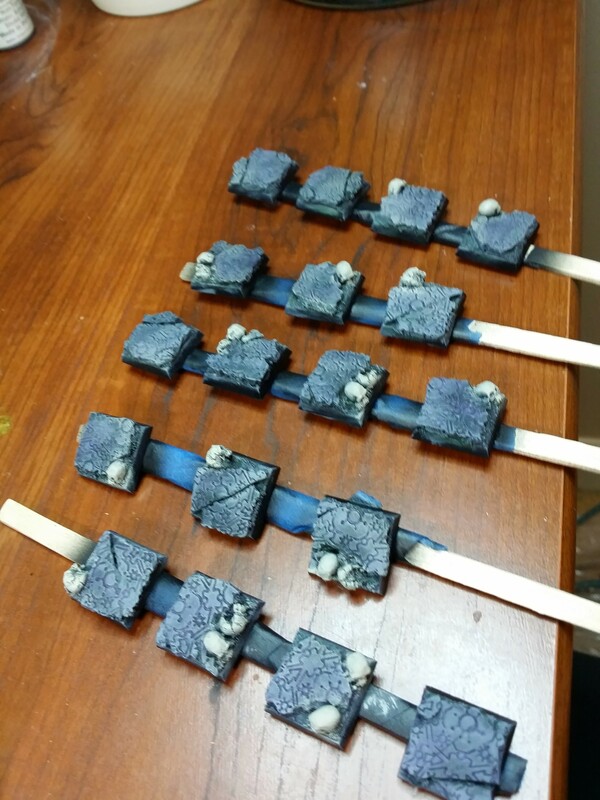 Recently, I painted a set of 18 resin Scibor bases for a unit of Dwarfs that I painted previously. 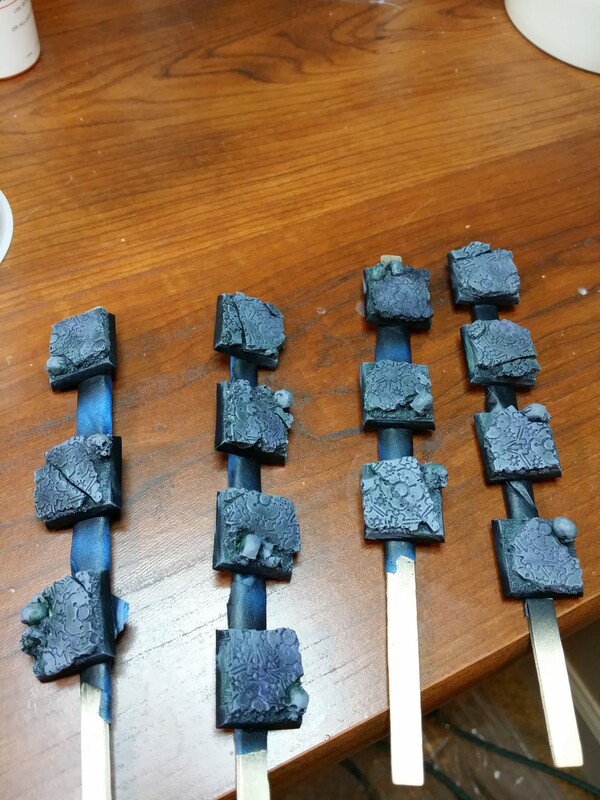 The first thing I did was wrap some craft sticks in painter’s tape, and then put the bases on the stick for airbrushing. 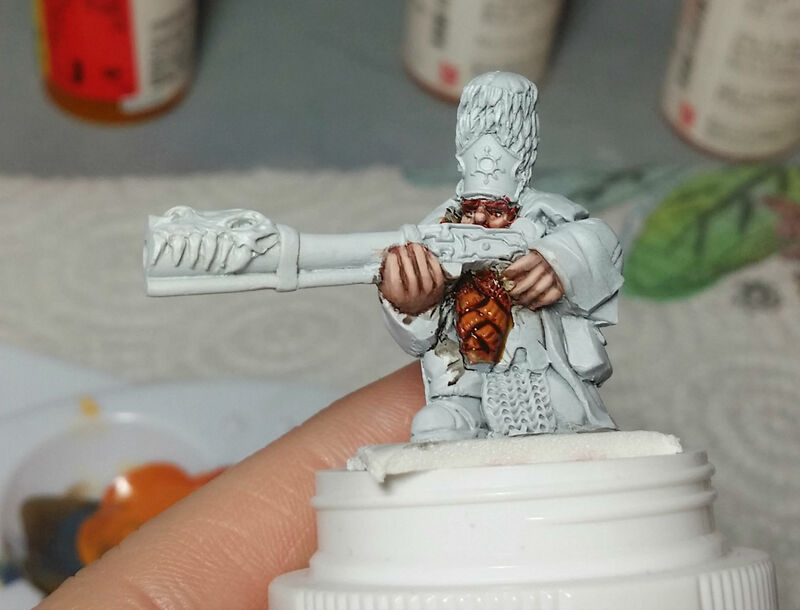 This is probably the easiest way to hold them for airbrushing, and it can really help speed up the process. 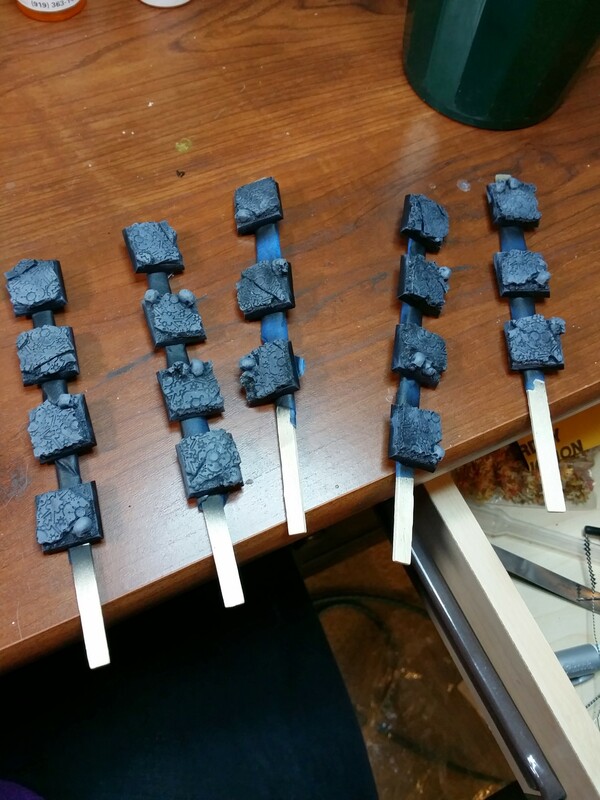 Then, I primed them with black Vallejo Surface Primer. 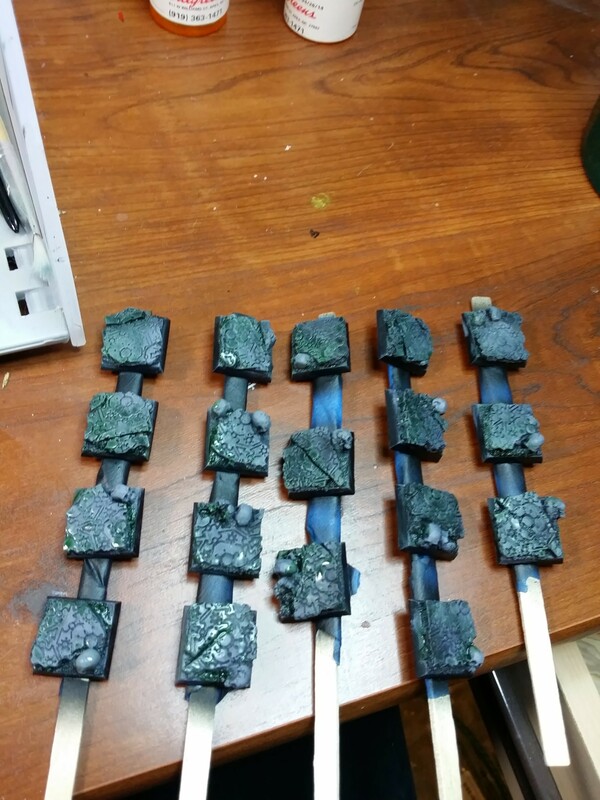 Next, they were drybrushed with a medium grey. 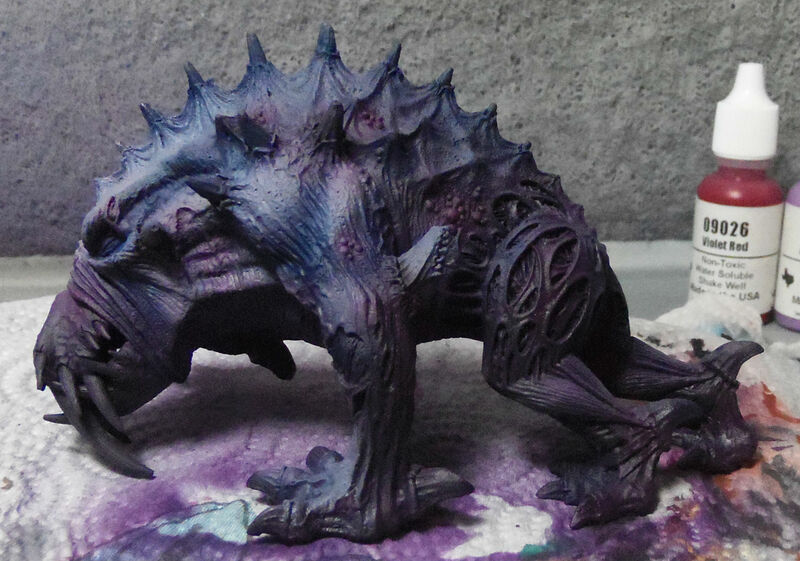 Then with Army Painter Purple Tone ink. Adding many layers of unexpected colors can help create depth and interest. Many other colors would be fine to use, just go with what feels right to you. I wanted the overall result to be cool colors with the skulls really standing out, so I thought blue, purple, and green would be great hues to include. 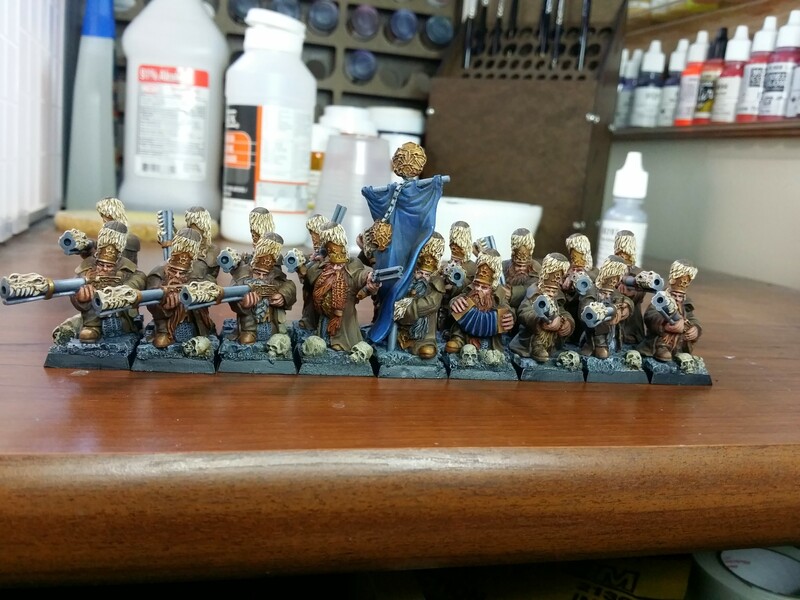 The Dwarfs have quite a bit of blue on their own though, so I left that color out of the bases. Then they were drubrushed again with RMS Cloudy Grey. 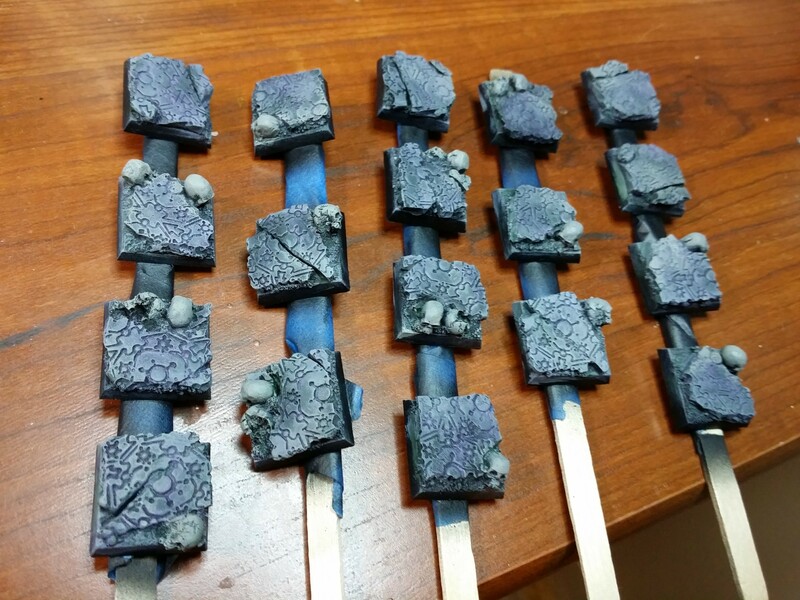 Next, the skulls alone were heavily drybrushed with RMS Cloudy Grey to pick them out. 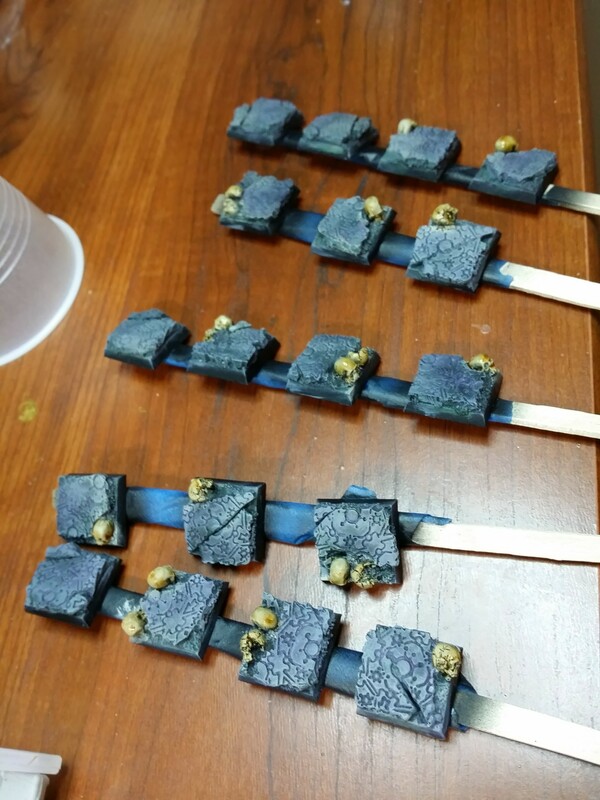 Then the skulls were drybrushed heavily with a mix of RMS Cloudy Grey and RMS Amber Gold to gradually bring them to their final color, but still keep them tied into the base overall. 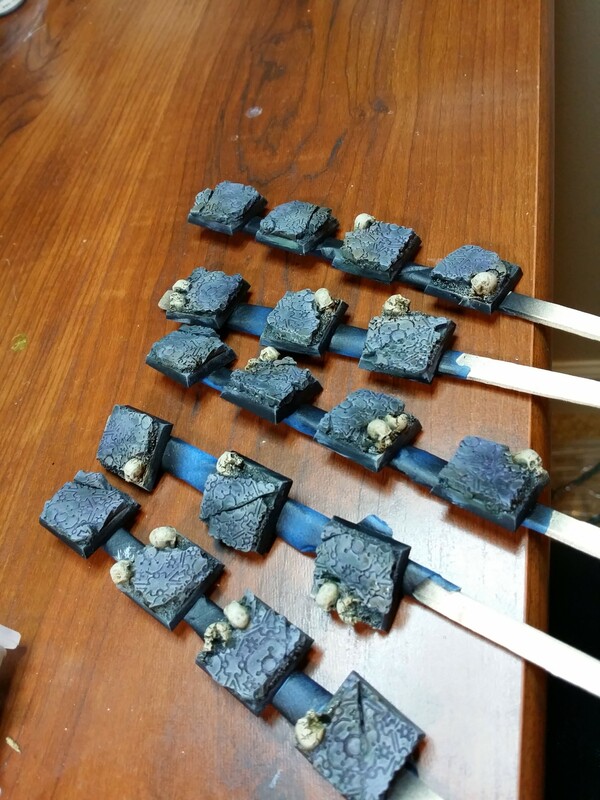 Then, the bases were washed in some areas with GW Agrax Earthshade and GW Seraphim Sepia, and the skulls were drybrushed with RMS Yellowed Bone. 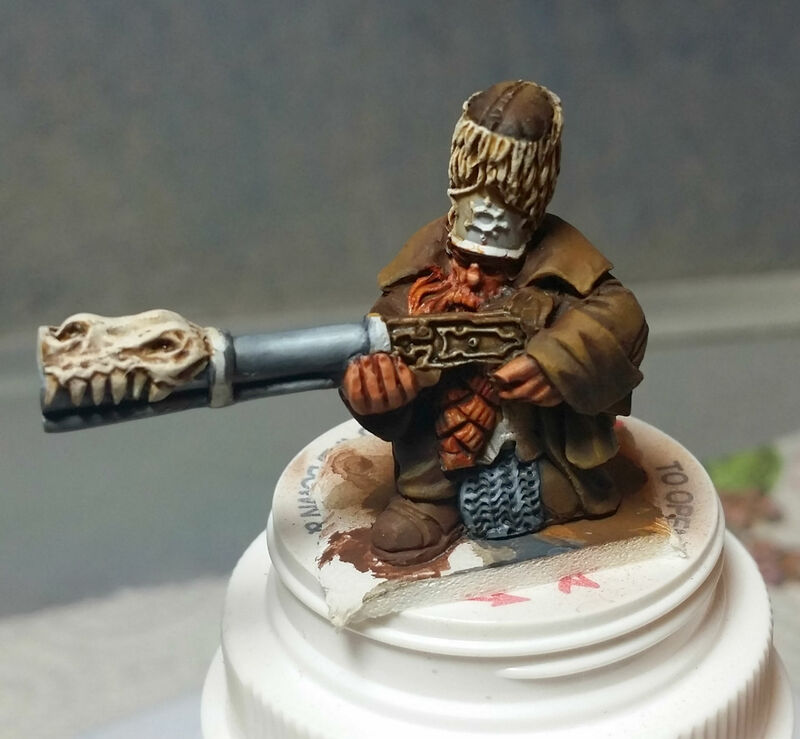 The skulls were then washed with GW Seraphim Sepia. 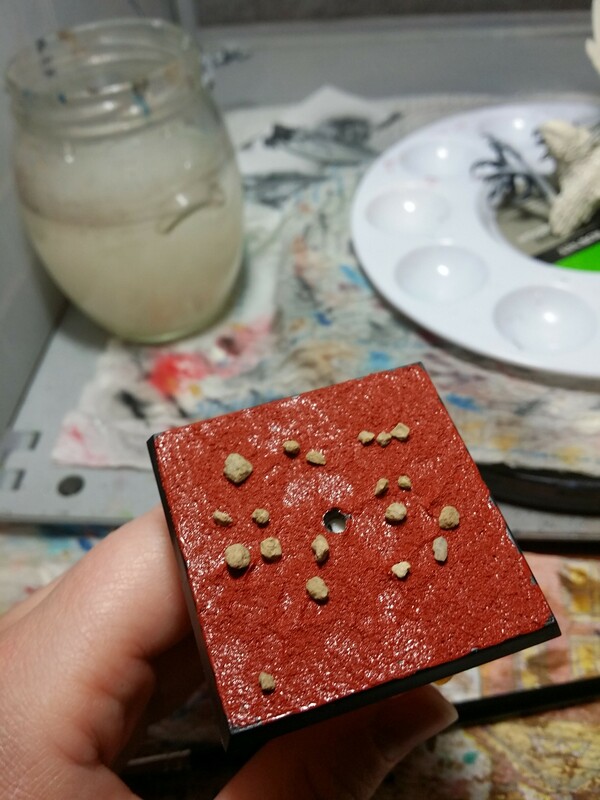 After that I picked out some areas of the stone with a light drybrush of VMC Light Sea Grey, which has quickly become one of my favorite paints. 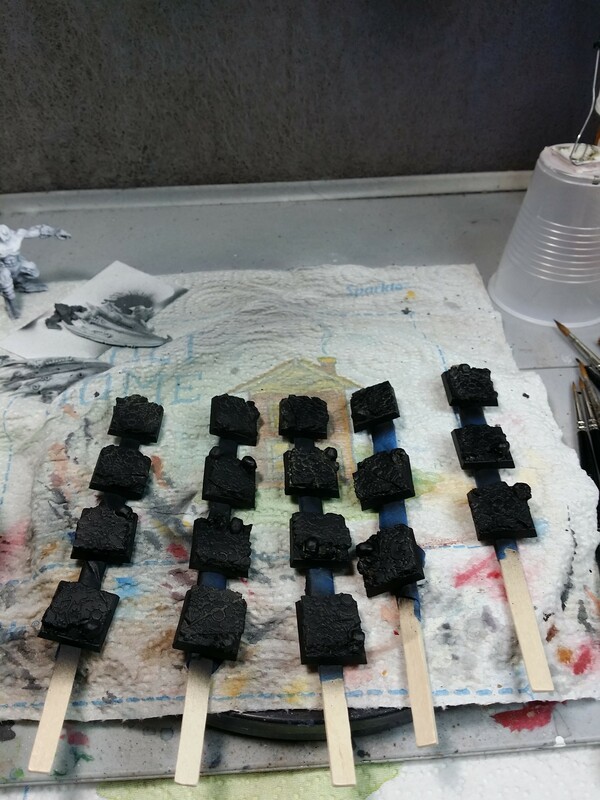 After that all that was left was to black out the edges and take them off the sticks. This whole process was very fast and very simple, but the results speak for themselves! 1. 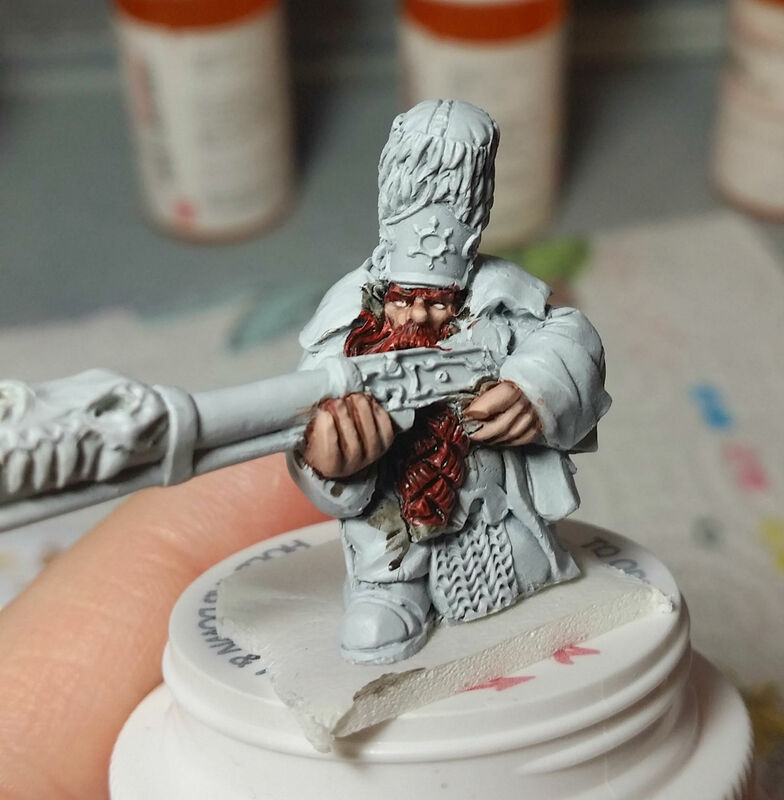 Basecoat the beard and skin with Vallejo Model Air Mahagony. 2. Use Reaper Master Series Tanned Skin mixed with VMA Mahagony and coat the skin. 3. Highlight the skin by adding RMS Rosy Skin gradually. 4. Paint the eyes with RMS Linen White. 5. Line the eyes and paint in the pupils with RMS Brown Liner. 6. Use RMS Flesh Wash on the cheeks and between the fingers. 7. Highlight the beard with RMS Rust Brown, then mix in RMS Palomino Gold and gradually increase the Gold as you layer highlights. 8. 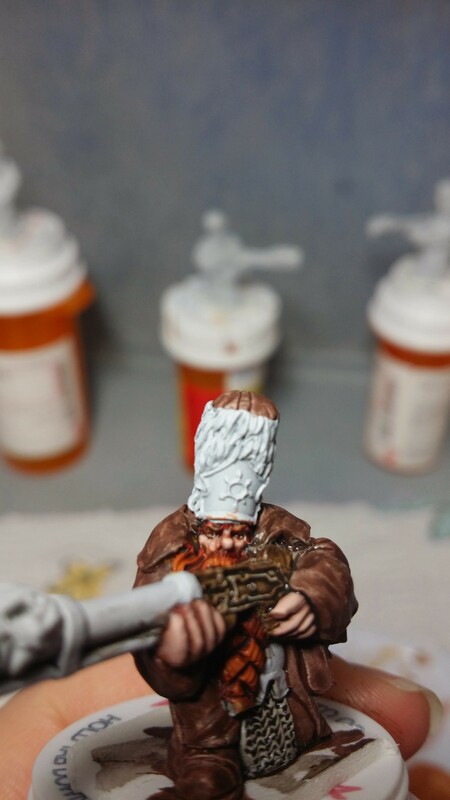 Wash the beard with Games Workshop Seraphim Sepia. 10. Wash the gun haft with thinned RMS Brown Liner. 11. 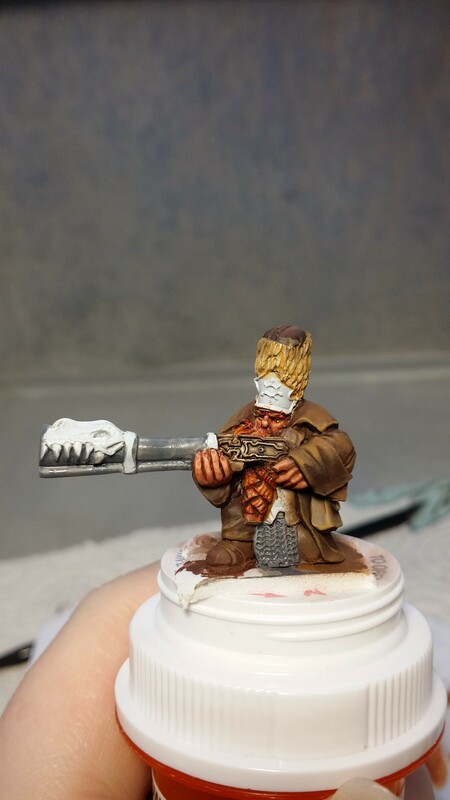 Basecoat the coat with RMS Dark Skin. 12. 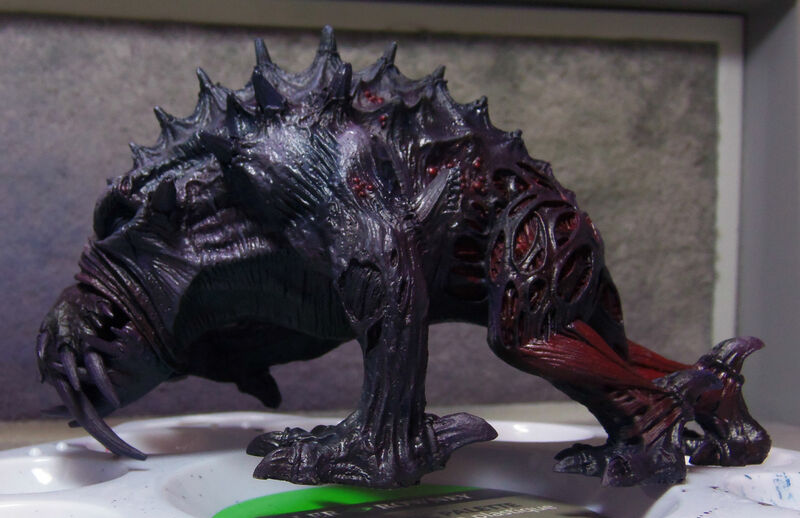 Wash the skin with a mix of RMS Flesh Wash and GW Seraphim Sepia. 13. 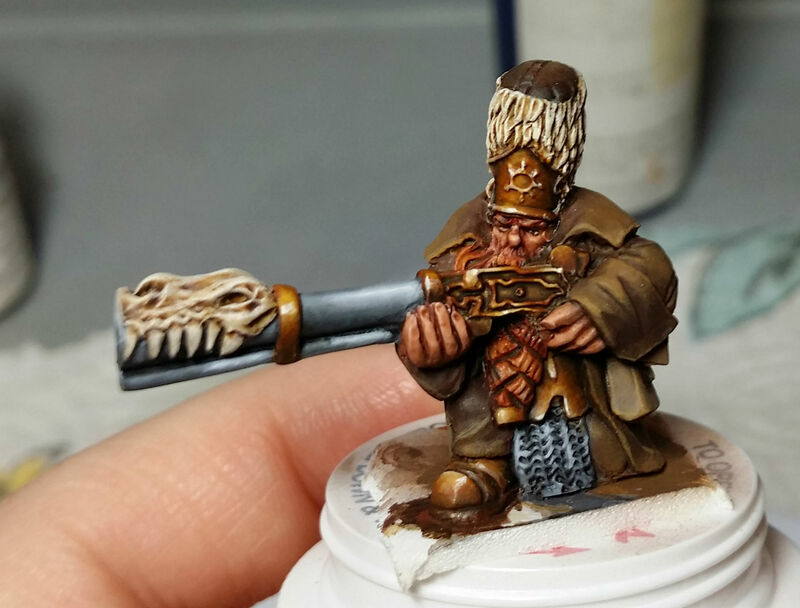 Airbrush shadows in the coat with RMS Blackened Brown. 14. 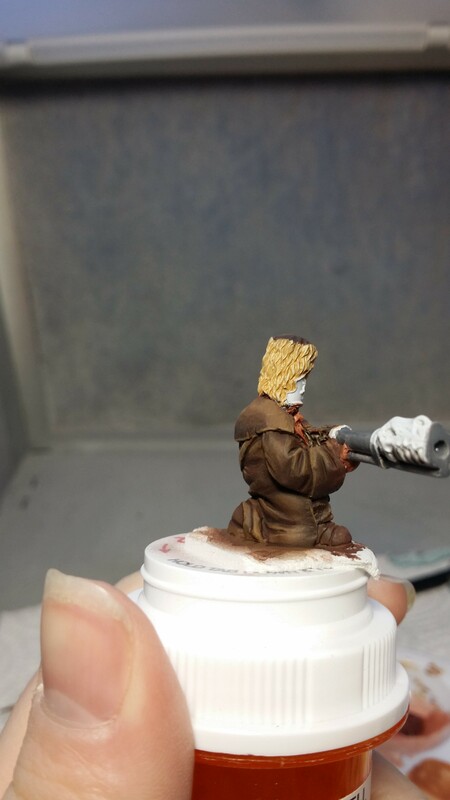 Airbrush highlights in the coat with a 4:1 mix of RMS Chestnut Gold and Dark Skin. 15. 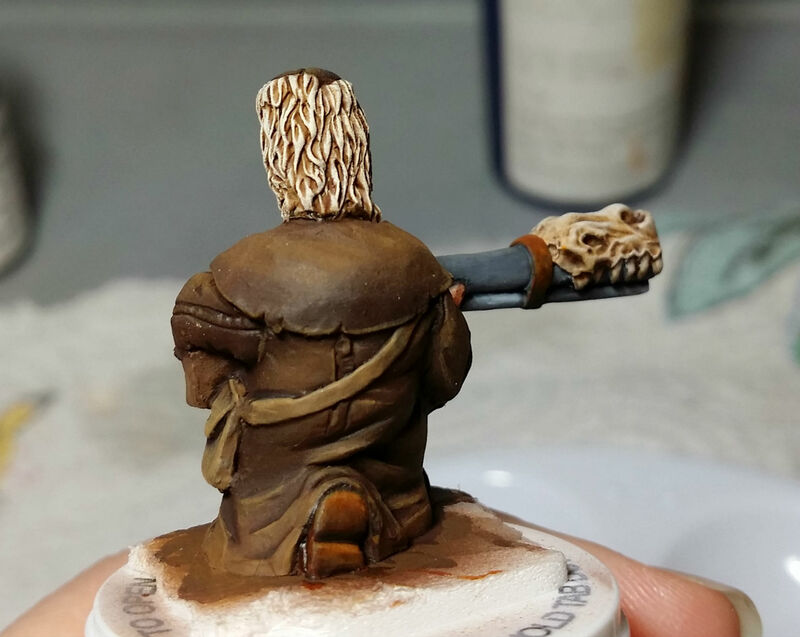 Use a brush to touch up the shadows on the coat with RMS Blackened Brown. 16. Touch up the highlights with RMS Chestnut Gold. The rest is coming up tomorrow! 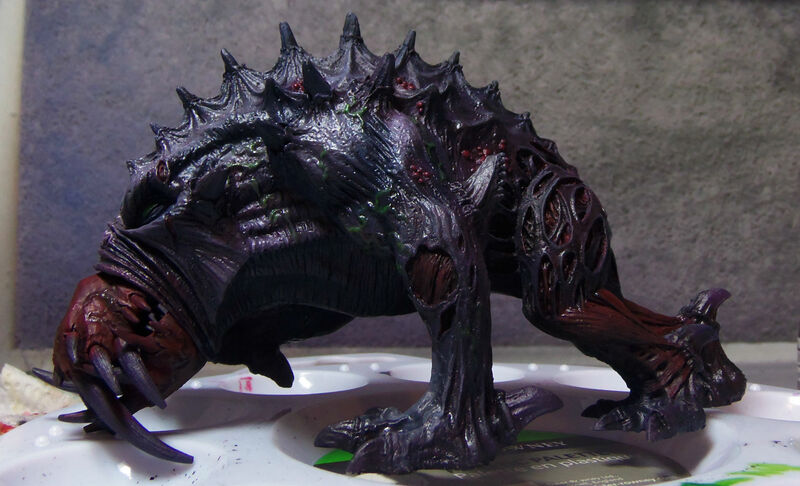 This Giant Spined Chaos Beast was previously owned and partially painted, but I am painting over it. 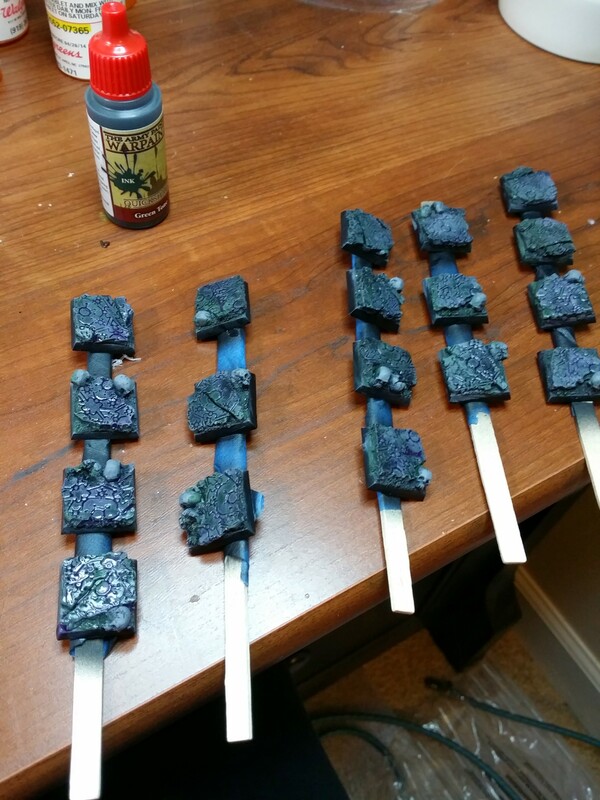 Reaper Midnight Blue, Reaper Nightshade Purple, Reaper Ritterlich Blue (not pictured), Reaper Viper Green (not pictured), Vallejo Model Color Green Fluo (not pictured), Reaper Monarch Purple, Reaper Amethyst Purple, Reaper Violet Red, Reaper Blush Pink, Reaper Pure White, Reaper Cloudy Grey, Reaper Aged Bone, GW Agrax Earthshade, Liquitex Carbon Black Acrylic Ink. 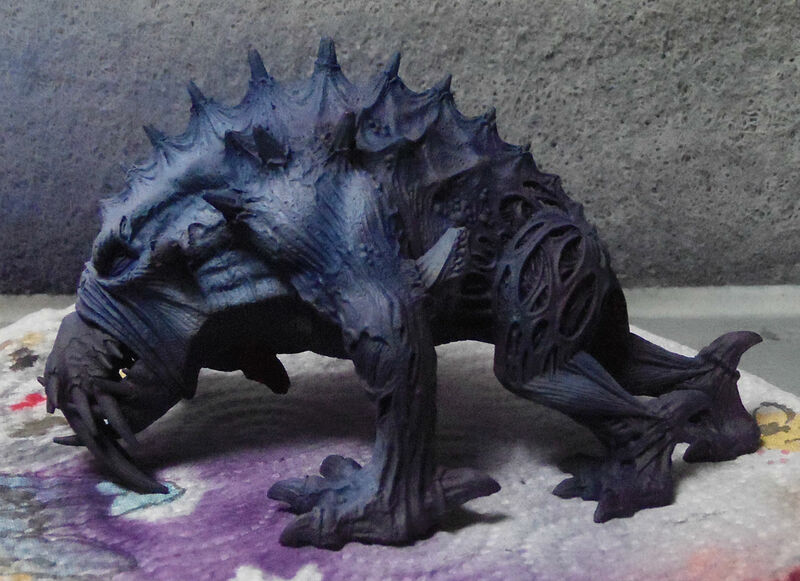 Step 2: Airbrush 1:1 mix of Midnight Blue and Nightshade Purple to underside of model and in the shadows under the horns and muscles. 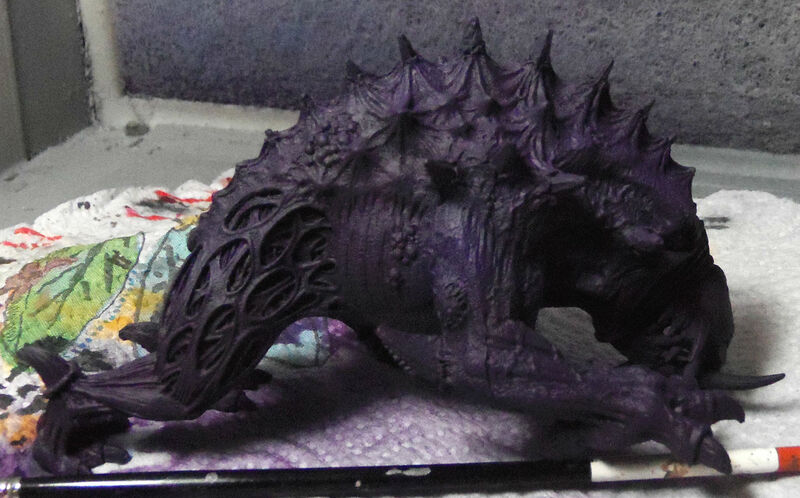 Step 3: Airbrush highlights of 3:2:1:1 Monarch Purple, Amethyst Purple, Cloudy Grey, Midnight Blue to top surfaces of horns, head, muscles, feet, and mouth. 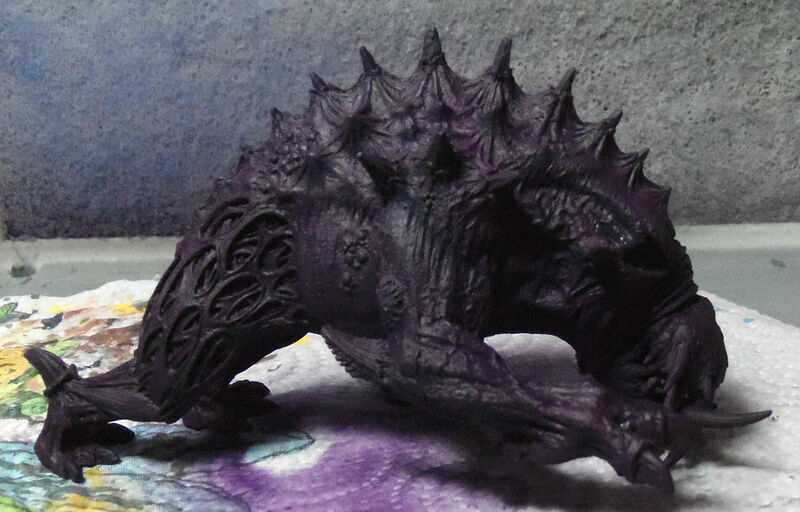 Step 4: Airbrush further highlights of 2:2:2 Monarch Purple, Amethyst Purple, Cloudy Grey. Step 5: Airbrush Ritterlich Blue to underside of horns and muscles. Now we’re going to work in the lighter purples and greys. 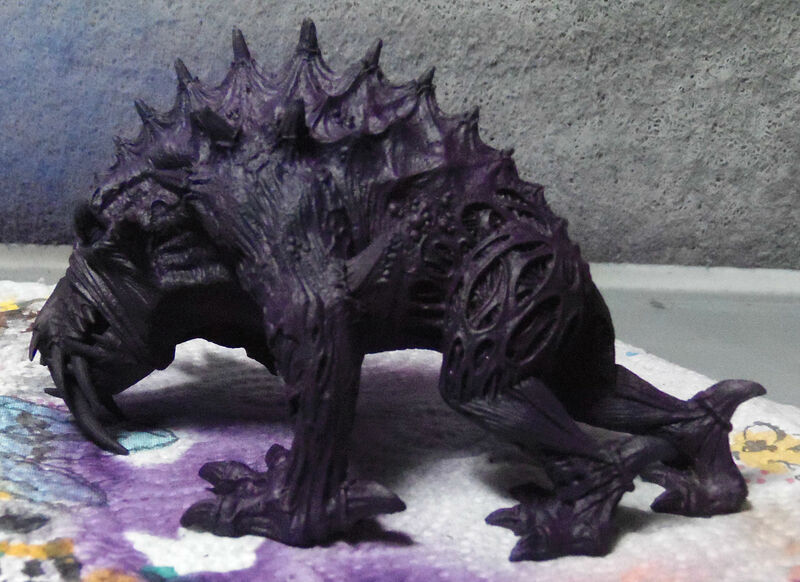 Step 6: Airbrush 1:1 mix of Cloudy Grey and Amethyst Purple. 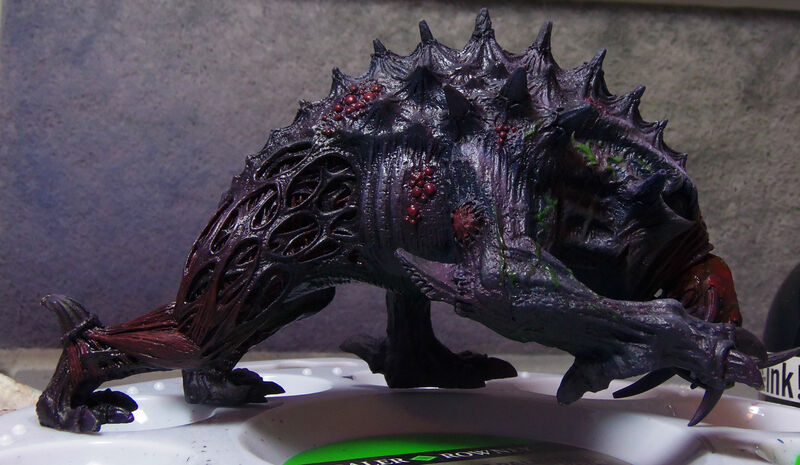 Step 7: Airbrush Violet Red to areas around pustules and as desired elsewhere on the skin, especially areas where the skin is stretched such as around the mouth and on the elbows. Step 8: Brush a 1:1 mix of Violet Red and Blush Pink onto the pustules and into the cuts. Step 9: Wash with a heavily diluted (5 or 6 to 1) mix of water and Black Ink. Step 10: Use mixes of Amethyst Purple/Blush Pink and Amethyst Purple/Pure White heavily diluted to bring up the highlights. 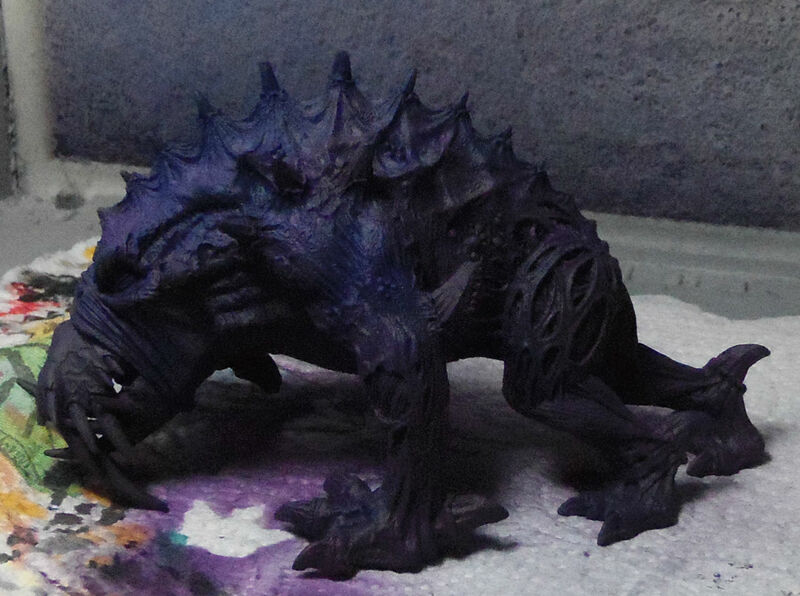 Use Ritterlich Blue and Nightshade Purple also heavily diluted underneath muscles and horns to deepen the shadows. 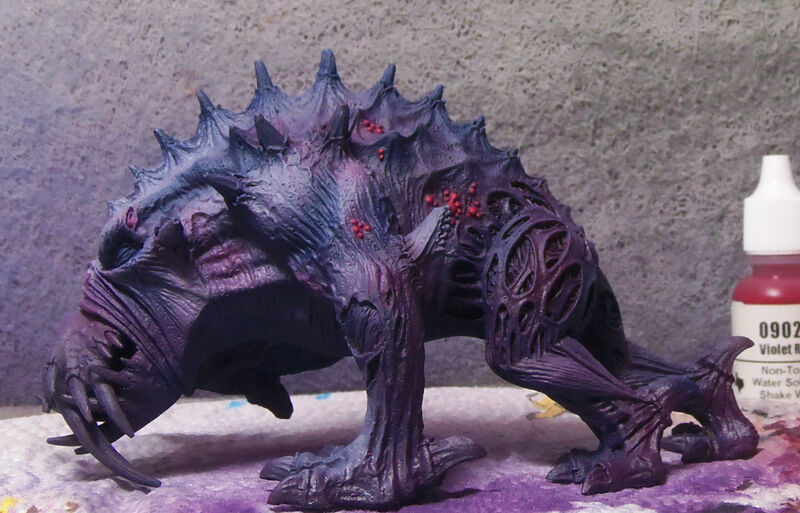 Step 11: Basecoat the muscles in Violet Red and blend smoothly into the underlying skin color where skin and muscle meet. 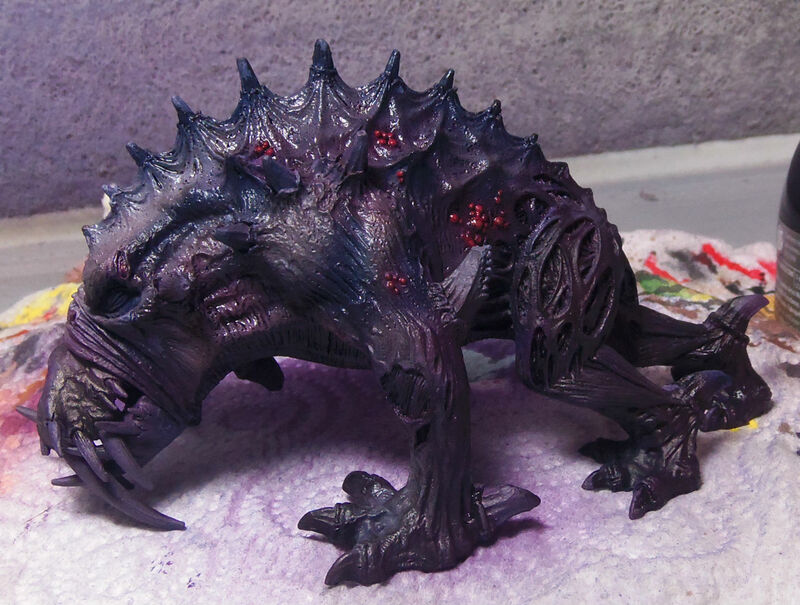 Also basecoat the snout with Violet Red. Step 12: Wash muscles, sores, and snout with black ink. 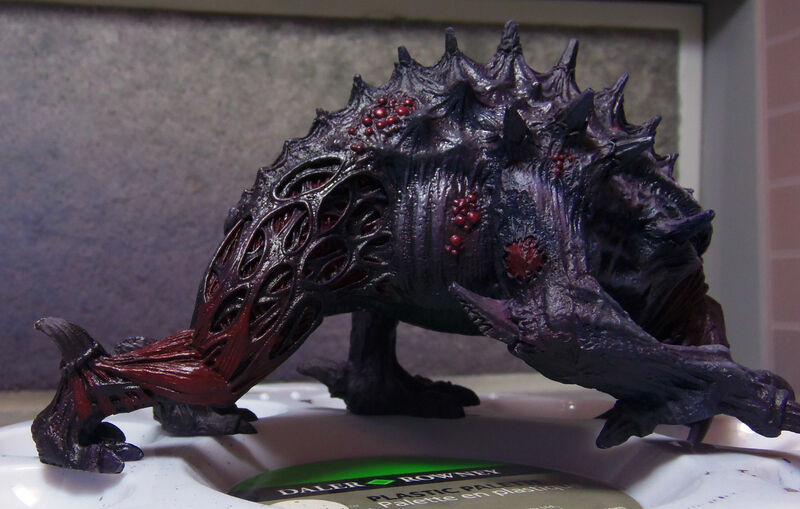 Step 13: Use Violet Red to paint first highlight onto muscles, sores, and snout. 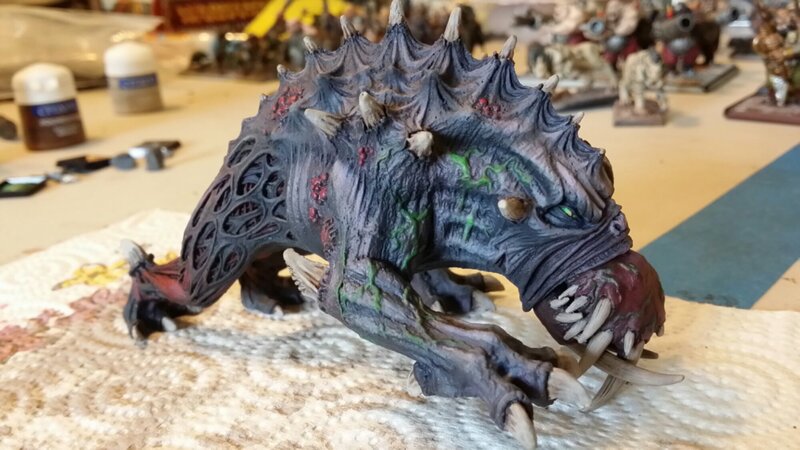 Step 14: Use 1:1 mix of Violet Red and Blush Pink to paint second highlight onto muscles, sores, and snout. Step 15: Paint eyes Viper Green. 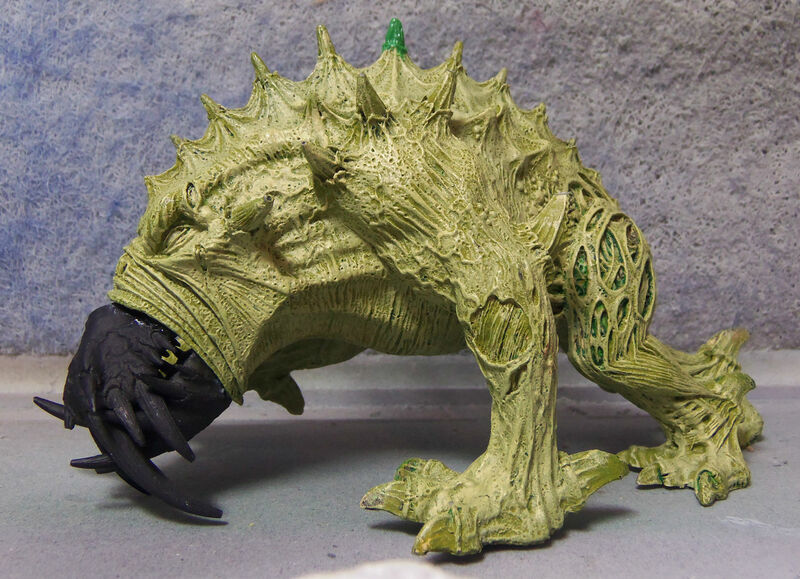 Step 16: Use mix of 1:1:2 Viper Green, Green Fluo, and Glaze Medium to glaze veins on legs, neck, and snout. 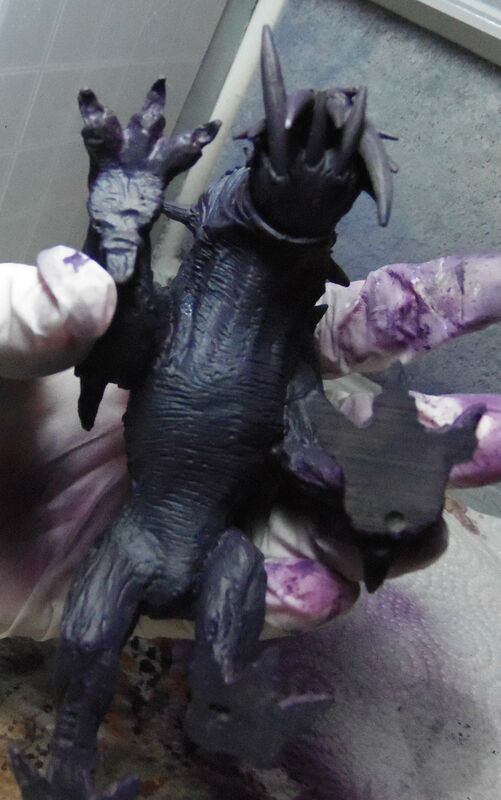 Step 17: Basecoat the horns, claws, and teeth with Aged Bone, then wash with Agrax Earthshade. 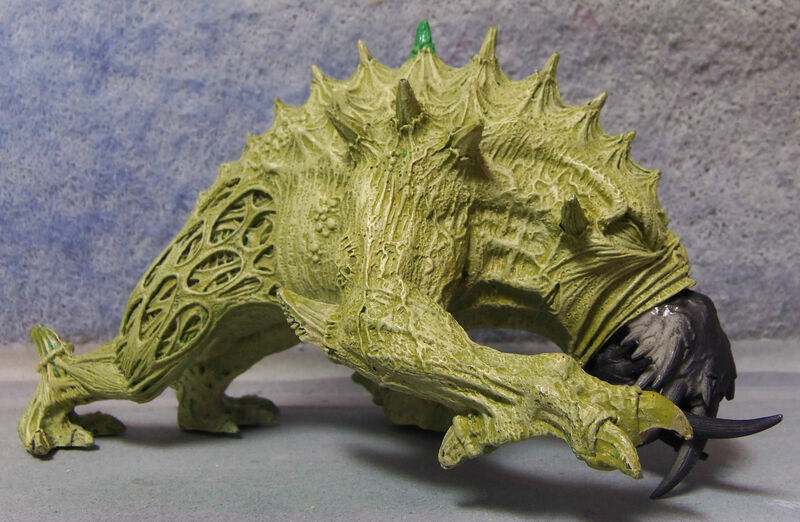 Step 18: Highlight horns, claws, etc. back up with Aged Bone. Step 19: Take your choice of yellows, greens, and reds. Blend the eyes from green at the far end to reddish in the inside. Put in vertical pupils closer to the inside than middle, but not too far in. Step 20: Seal with matte varnish.